THE NATURAL HAVEN: Natural hair: Have you been to the salon? Natural hair: Have you been to the salon? I had a huge chuckle from a comment left by one of my readers regarding the previous post on whether natural hair is too complicated. I didn't post this comment in because it was in part an attack on another blog which would deflect attention from the subject at hand. Looking at the site, everyone started to look like a mushroom (I don't know I'm easily amused). I'm not against Miss Jessie's. I think you know what you will get should you go to the salon to have your hair done. I commend them too for being enterprising. I don't think their hairstyles are very inventive and their products in my view are overpriced. I think F2x on fotki should set up shop and show us how it is done. So follow up question, since going natural have you ever gone to a salon, what did you have done, was it a good experience or bad experience, will you go again? My answer - Yes, one time 7/8 years ago, I had my hair microbraided with extensions. Terrible experience, was offered a relaxer first before braiding, declined this. Was then told my hair had to be blow dried straight first, which I agreed to. Blow dry with comb attachment, grease, too hot, smoke, pain etc, complained and refused hairdresser to continue. Was told I am a difficult customer and my hair would look lovely if I relaxed it. Asked for my hair line to be left out, request was honoured (rolling eyes, tongue clicking) but I was told I wouldn't look nice. Left with pretty braids which I liked but hell would freeze over before I repeat this experience. I haven't gone yet since natural but plan to experience one at least once when I get a job. I've heard of a couple salons that are natural friendly in Brooklyn so we'll see. I've been to the salon a couple of times for braids, and I've had exactly the same experience. My scalp will never forgive me for that first blow-dry, and the women were so salty when I came in with my natural hair. The second time I did it was less painful. Also, the staff at the salon were nicer because they saw how much my hair had grown, and how much softer it was. Granted they still blow-dried it within an inch of my life, but now that we've established a relationship, and they know I won't be relaxing my hair anytime soon (or ever), I would go back there to get a roller set or something done. I would like to try a natural salon, though. I think I just got lucky though? That's lovely Alice!! I think I should have said my experience was in Kenya and they are not afraid to be salty (lol mellowyel). I think in USA and UK, the hairdressers need you to come back so they are inclined to be polite and helpful. @agrlcanmac - If you do go to a salon and have a good experience, let us know!! Ouch Laquita - that made me squirm!! Nail glue, braind falling from the root....ouchhhhhh! The last time I went, I had all my hair cut off within an inch or so. That was 2 yrs ago. I had burned it straight from too much flat ironing. The time before that was to get my ends trimmed. Since the last chop, I have not been back. Anything I want done I just do it myself because they all look at me like they have no idea where to even begin. The afro twists were not really done in a "salon" per se. Just a lady in her house. I actually did my big chop at a natural hair salon in Brooklyn and was extremely pleased. I had some apprehension as to what to expect but the stylist was very helpful and loaded me with tons of tips. I felt very comfortable in the salon and it was a beautiful sight to see every woman in the salon with natural hair (well except me-but that changed very quickly). Right before the stylist took the plunge for my hair, she looked at me and asked me if I was sure I was ready. I chuckled and said "you seem more scared then me" lol. I wasn't scared at all (never have been afraid of the scissors). I was def. ready and had a vivid image of what I would like with short hair being that I have had various lengths with my relaxed hair. I loved my end result and wondering If I should get my trims done there or continue to do them myself. At any rate-I had a good experience. Regarding Miss Jessies-that is actually the salon I had my eyes set on to do my BC. Lets just say after I was told the prices I was forced to do some serious, serious research on other salons!!! Don't get me wrong I was prepared to spend and very aware that natural hair salons are expensive, but I was not going to pay what they were asking to do a BC. Fortunately/unfortunately, I go to the salon all the time. I've been natural since July of last year. The salon where I went in for my big chop is the one I continue to go to. They specialize in natural hair, are pleasant, and will give me tips when I ask for them. I've gotten finger curls, rod set, and two strand twists. Although it's been a good experience, it's unfortunate b/c I've only experimented on my hair about three times since last summer. But I haven't made my next appointment yet, as I see with the two strand twists--it's something I can do myself and I need to see what works and what doesn't. Anyway, the man at the barber shop was steady complaining the entire time about how I was setting black folks back 100 years because I refused to "fix" my hair. That's the last time I took my "broken" hair to anybody else to do. Thank you very much. It is so sad how alot of cosmetology schools don't teach their students how to do natural textured hair. As an instructor of cosmetology and a woman w/ natural hair, I've tried to make changes within, but if it isn't popular, it doesn't become part of the learning experience. Things are starting to change now, but it's VERY slow. Students are taught that the money is w/ quick things such as haircuts, relaxers, and color. They are conditioned to believe that our hair in it's natural state is too time consuming and not quick money. Only the smart few realize that natural hair isn't that hard to deal w/ and that these women will remain faithful to great stylists b/c these type of stylists are far, few and in between. 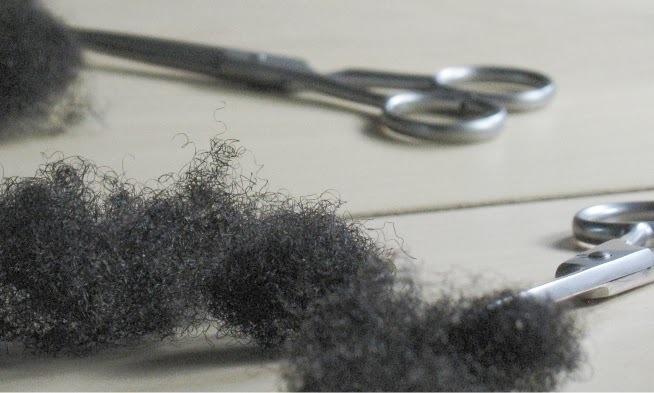 He was old school, when she was using a paddle brush to gently try and go through my thick tender scalp he was raking through it with a blow dryer with teeth saying all the while," All that on the floor is dead hair, you got some thick hair and you tendered headed why did you go natural". Frankly I politely smiled but it was none of his business, its my head and life, and I was getting really annoyed. My head hurt and half of my scalp and hair was on the floor. He then looked at my daughter who was then 4 months and said," Are you going to let her be natural to"? I politely said "yes she is" and he said "ohhh boy". Frankly I still talked to the girl a few weeks after I left but I never went back. i only know one natural hair salon that i got a treatment at,they seem to specialise in dreadlocks though,those with natural hair were havin their hair locked i didnt see any other style.i have a hairdresser whom ive known for like 6 years,(from relaxer,texturised and now natural), she told me my hair was growing and that i shouldnt relax it,(she herself is relaxed ),so its cool.i did however go 2 someone else to do braids and she kept on asking me questions ,i got so annoyed wiv her. Last time was about 6months ago and I'm natural for 7months now...My TWA had to be blow-dried, so that its 'easier' to plait AND extensions had to be put in so that the cornrows can last longer...my hair was pulled so hard, I had headache and painful head for about 4 days straight, i had to take painkillers before i slept. That was the last time I was at a salon...never again, unless I find someone who understands natural hair...some days i do miss being pampered. I went to a natural salon for the first time about a month ago. Jc, there was so much "soul love" in that place. The stylists were sporting fros, locs, braidouts, twists and bantus. I got a dark rinse, the steam treatment, the DC and my first blowout. (I couldn't stand having straight hair. Three days later I washed my kinks back in..lol.) That place was the bomb, though and I will definitely be back. I've been to hairdressers five times since my last relaxer in 07. Only one experience (pressing while transitioning) was positive. The rest left me having SUPER damaged hair, having to literally cut INCHES off after I rinsed the style out (a press on BSL all-natural hair in 12 and a press, then later a weave on SL hair in 09). I am mostly struck by the lack of professionalism that I experienced in these salons. Only one would ever have gotten my business or recommendation ever again. The rest knew nothing about preserving health or following directions. This in addition to being unprepared for my hair. I'll admit, it's thick, but if I've already washed, detangled, and stretched it until dry, all you need are the right tools (one kept sneaking to use a rattail comb and grease in my hair after I brought my own supplies and gave explicit instructions) and patience. Now there is really no one I will allow in my head except my ma, who I'm convincing to remain on the nappy side. I wash, trim, cut, braid, twist, etc. my own hair since that last experience. I just cannot bring myself to return to a salon. I can damage my hair beyond repair all by myself, so why pay someone else and give up an entire day?